With the wait over, fans trooped to the various match centres to once more catch a glimpse of all happenings. Well served as the 6 games played produced some 12 games with Kotoko playing away to Medeama later on today. Ashgold grabbed a point away in Bechem with Inter Allies doing same at WAFA. Liberty put 4 past Dwarfs at Dansoman with Sharks swallowing the mighty Oak tree at Elmina. Finally, Dreams FC gained a point at home against Karela. The results mean Karela United and Elmina Sharks currently share the summit of Zone A on 4pts each with Ashgold moving to the apex of Zone A on the same points. 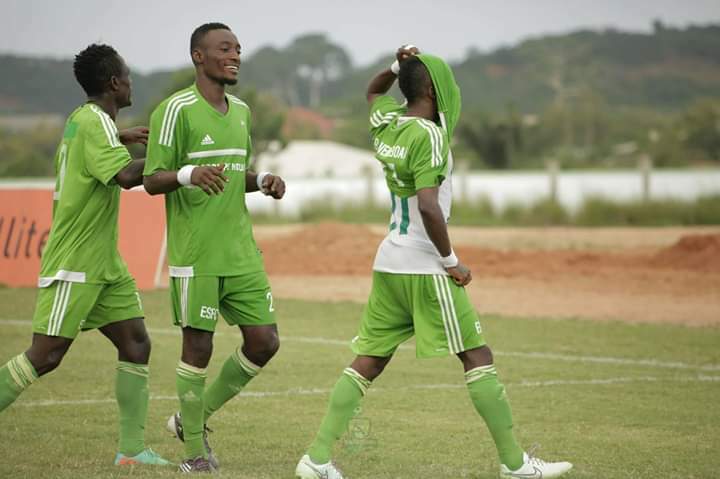 Having lost away in the first league game, Dreams FC returned home with higher hopes of amassing their first maximum points. Samuel Alabi put them in pole position with a good goal only for Karela to find the much needed equalizer. Interestingly, the pride and passion boys managed a goalless game the last time they visited Dawu in April, 2018. A trend to follow? The phobians fell to a rather late goal by Felix Addo at Elmina. Addo, formerly of Liberty and once courted by club giants Hearts of Oak and Kotoko is yet to lose a league fixture in the green and white colors to Hearts. He has played in 2 games against the Phobians, winning all two aside scoring in all two. Kingsford Opoku got his second home goal of the season in his second game at Sogakope and what a start to the season he is having. The academy product's heroics has thus far been only bettered to an extent by Karela's Diawisie Taylor who has managed 2 goals in his last two away goals. Can they end the season as the top scorers? To early to tell. Proximity considered, one can put the Aduana Stars- Techiman Wonders game in the derby brackets. A game bearing all the characteristics of a Derby saw 2 old names get a goal each for their sides. Alex Asamoah, a goalking winner in the 2008/9 season with Asante Kotoko is still scoring at age 33 as he bagged his first goal of the campaign with a consolation at Dormaa. Yahaya Mohammed, 31, like wine, grabbed a goal too. Will they ever get old enough to miss the post? Dansoman football fans were treated to a 4-0 victory over Dwarfs. The margin was last recorded at the venue in July, 2016. Addo's brace for Liberty makes him the first player to do so since October, 2017. The last player to get a brace for the scientific soccer lads being Bernard Arthur.